Whether we live in earthquake country or may one day visit an area where earthquakes are possible, we need to know how to protect ourselves during these events. Many of our out-of-state and international students may have never experienced an earthquake and have had little to no earthquake preparedness education. Some of us may know what to do, but have not practiced how to protect ourselves since we were children. We encourage you to mobilize your students, faculty, and staff to participate in the largest earthquake drill ever, along with the rest of the university. Kentucky is affected by earthquakes from several seismic zones in and around the state. The most important one is the New Madrid Seismic Zone, in which at least three great earthquakes, each estimated to have been greater than magnitude 8 on the Richter scale, occurred from December 1811 to February 1812. Though the state was sparsely settled, these great earthquakes affected the whole Commonwealth of Kentucky. You can help us keep our students and community prepared and safe by encouraging participation in the Great Central U.S. ShakeOut Earthquake Drill (www.shakeout.org/centralus/) on October 20th, 2016. 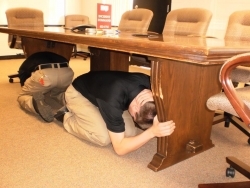 Each year more than 25 million people participate in Great ShakeOut Earthquake Drills worldwide, in K-12 schools, colleges, businesses, government agencies, other organizations, and households. If there is no table or desk near you, drop to the ground and then if possible move to an inside corner of the room. Be in a crawling position to protect your vital organs and be ready to move if necessary, and cover your head and neck with your hands and arms. Do not move to another location or run outside. Earthquakes occur without any warning and may be so violent that you cannot run or crawl. These are guidelines for most situations. You can go to www.earthquakecountry.org/step5 to learn what to do in specific settings. We invite you to participate in this drill by asking students, faculty, and staff around you to practice the steps of Drop, Cover, and Hold On. Your participation in this year’s Great ShakeOut Earthquake Drill is completely voluntary and it is a great opportunity to practice some very important procedures. Most drills will be held at 10:20 a.m. on October 20th, however drills can be held at other times as well. Our drill is planned, out of sequence, and will be initiated with a test message through our emergency notification system, on Wednesday, October 19th at 12:20p.m., to coincide with the regularly scheduled monthly test of Rave Mobile Safety and the Madison County Outdoor Warning Siren System. If this is not a good time, drills can be held at other times, if better suited for class schedules. A ShakeOut instructional guide and 4-slide PowerPoint presentation for use by instructors in their classes and laboratories are available at www.ShakeOut.org/colleges. The presentation links to a 60-second “Drill Broadcast” narration with earthquake sound effects that can be played during your drill. Everyone should sign up for our University’s Emergency Notification System http://www.emergency.eku.edu/emergency-notifications. Everyone should have an emergency kit in your car and home and an out-of-state contact you and your family can call to check-in after a disaster. A list of Disaster Supplies can be found at the end of the E K U General Emergency Action Plan and Template http://emergency.eku.edu/sites/emergency.eku.edu/files/1_eku_general_emergency_action_plan_-_template_-_10132016.pdf. You can check in and allow others to search your status after a disaster by going to and using the American Red Cross – Safe and Well Website https://safeandwell.communityos.org/cms/index.php. Everyone should learn how to Drop! Cover! Hold On! http://www.dropcoverholdon.org/. For preparedness information and resources specific to Eastern Kentucky University, visit http://www.emergency.eku.edu/. If you are able to participate in our drill, thank you. If you are not able to participate, we hope that you can find the time to review the material presented in this article and the E K U Test Alert on Wednesday October 19th.